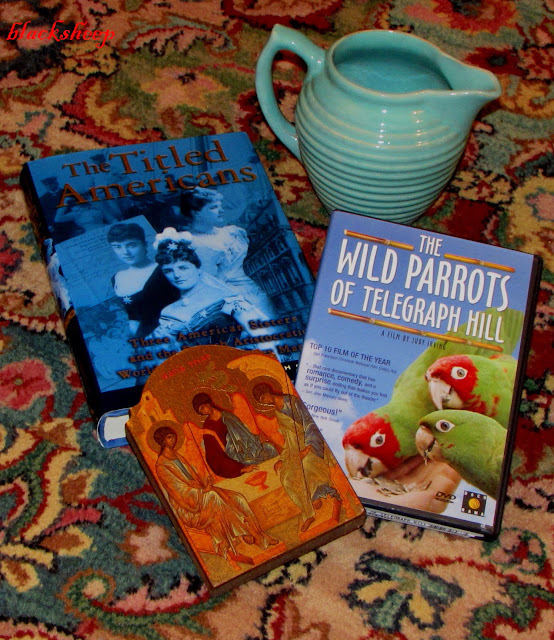 ... this weeks haul includes....a book about the Jerome Sisters, a Depression era pitcher, a DVD about the feral Parrots here in the City - and a great little Icon. Short and sweet today sports fans, thanks for stopping by do stop again!! OoooOOOOoooh! I love the little pitcher!! The pitcher is beautiful, great finds! A nice group of treasures! You've had another successful "shopping" adventure! I actually have heard about the parrots, but can't remember much. I think I will google them and read up on it! Thanks for sharing! Great haul! I love the little pitcher. I think I'd much rather have feral parrots than all the feral cats I currently have.